Mobile Games with Real Life Superpowers. 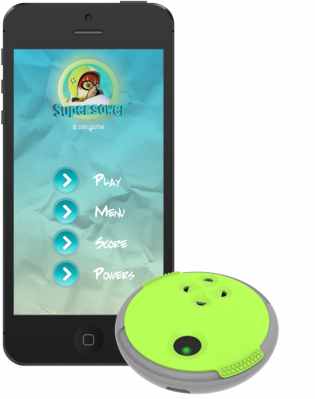 breath-controlled games thanks to our exclusive, patented technology embedded in the “Puck”. physiological variations of your breath, energy and brain Powers anywhere, anytime, right on your phone. from 20,000+ scientific studies published by the most prestigious research organizations. Zenytime supports knowledge sharing: our users share their biomarkers, stats and accomplishments, always unidentified, in "aggregate". Download Free Zenytime "my Powers" app. your brain, energy and breath Powers, have fun with breath-controlled games and track your progress. more about yourself: enjoy interactive metrics anywhere, anytime, in 5 minutes or less. your best self, play often and enjoy actual, objective measurements of your stress right on your phone.